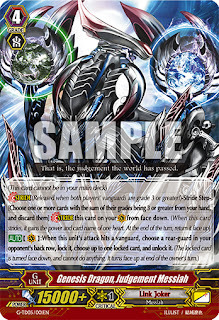 The English card of the day is the featured stride from G-TD05: Fateful Star Messiah, Judgement Messiah. A rare layered stride, Judgement Messiah has multiple effects as part of one skill that trigger sequentially, but not all of those effects have to be used every time. Like the Fighter's Collection 2015 stride Nectaria, Judgement's skill includes an initial effect that resolves on-hit and an optional secondary effect that resolves afterwards, but unlike her, Judgement's full skill does not depend on a specific heart to use. 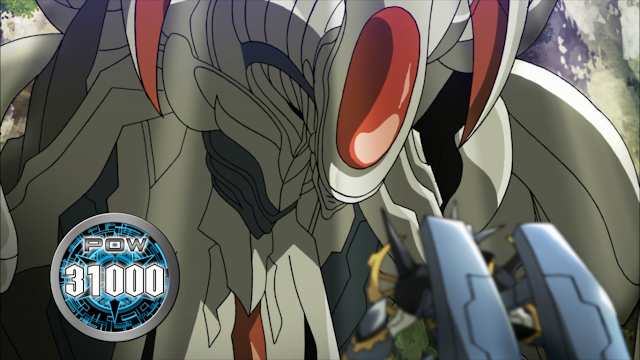 Mastering Judgement Messiah requires understanding the benefits of unlock in the Messiah deck, and when to choose to make use of it. When Judgement Messiah's attack hits, you can lock an opponent's backrow rearguard and then choose up to one locked card to unlock. The keyword here is "up to;" it is not by any means necessary nor always a good idea to unlock a card. 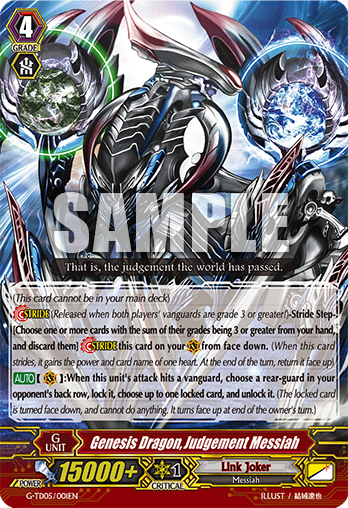 Particularly since Judgement is an early game stride like Gablade or Grim Recruiter, at the time you are resolving him the only locked card may in fact be the unit that he just locked. It's ideal to preserve the -1 that he incurs against the opponent, so in that scenario you would not want to unlock any units. 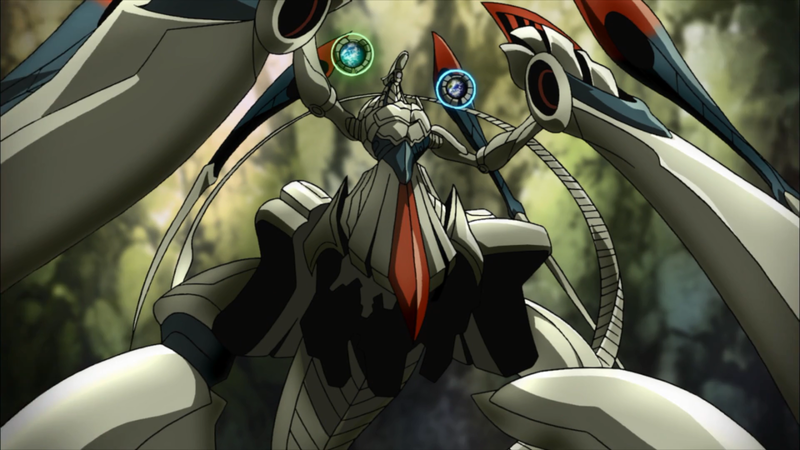 However, if you used Judgement Messiah in conjunction with the skills of the breakstride Alter Ego Messiah, then one of your own rearguards is already locked and it would be ideal to unlock that unit so that it can either attack, or trigger an on-unlock skill like that of Dark Metal Chameleon or the deck's first vanguard Neon Messiah. That way you can either countercharge a damage or search your deck for a copy of Alter Ego to discard for the cost of stride next turn. On the other hand, if you're at a later stage of the fight where Alter Ego's generation break 2 would be online and your own locked rearguards aren't omega locked, then it would be better to wait for your units to unlock on their own in the end phase so that Alter Ego's soulblast skill can activate and draw cards off those cards unlocking. Failing to exercise proper judgment in using Judgement Messiah will invariably prove costly, as one or more pieces of your delicate lock-unlock strategy will fall through the cracks. The major hole in the Messiah deck at this time is its lack of effective unlockers, which are primarily relegated to still-unreleased promotional cards. Judgement Messiah is thus one of a few opportunities outside of Amnesty Messiah to trigger your on-unlock skills, and you should take advantage of that opportunity accordingly. Fateful Star Messiah will reach western shores on June 19th, 2015.